Of the 20 semifinalist nonprofit organization leaders chosen for the 2016 Social Venture Partners Arizona Fast Pitch competition, only eight will deliver the three-minute eponymous pitches for their organizations in front of an audience and judges. Fewer will win the competition’s sponsor-funded cash grants that total over $50,000. But contestants don’t have to win the money to get something out of the experience, previous participants said. The competition consists of a two-month training and mentoring program to help leaders prepare and hone their pitches. Just ask Valerie Churchwell, president and founder of Arizona Dream Builder Foundation, an education-focused nonprofit in the Valley. Churchwell represented her organization in the 2013 and 2014 competitions, and while she didn’t win either year, she considered it a helpful experience. “It made me very focused on our messaging, understanding that we needed to be concise, consistent,” she said, noting that some elements of her pitch have become standard parts of conversation among her board. The sixth annual SVP Arizona Fast Pitch competition and training program will be held between January and March 2016. The competition is free to enter, but applications are due by Oct. 16. SVP is an international organization that helps foster connections between donors and nonprofit entrepreneurs. It has locations in 39 international cities. Terri Wogan, executive director of SVP Arizona, said the competition is an outgrowth of the organization’s goals: It provides a platform for nonprofits’ messages to be heard while giving those nonprofits visibility within the community. The judges will choose 20 nonprofit leaders and three student nonprofit leaders as semifinalists. Wogan said the judges will pick semifinalists based on criteria like innovation and potential for impact. Each semifinalist is assigned two mentors who work with the leaders to refine their messages. Don Keuth, president of the Phoenix Community Alliance, has served as a mentor for five competitions and will serve as a mentor this year. He said the mentorship aspect is chiefly concerned with helping the leaders craft a message that is moving, accurate and differentiating – and three minutes long. Wogan said the mentoring process provides training for crafting a central message, which strengthens the nonprofits. But the training can benefit leaders personally as well. That was the experience for Candace Sherwood, director of development for St. Joseph the Worker, which helps disadvantaged individuals become self-sufficient and find employment. During the mentorship process, the semifinalists are whittled down into a group of eight finalists. Shortly after the group announces the finalists, the nonprofits present their three-minute pitches to an audience. The prize money helps. 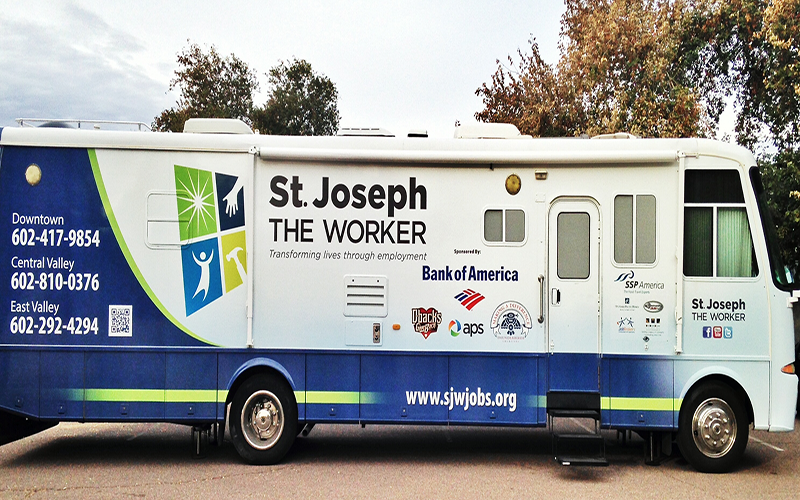 St. Joseph the Worker has been in the community for 28 years, but Sherwood entered Fast Pitch specifically to pitch the organization’s Mobile Success Unit – an office on wheels. Using the grants, the organization renovated the mobile unit and launched it in May of that year. “The timing was just so, so perfect,” Sherwood said. Finalists also benefit from the networking that occurs after the pitches, since the crowd often includes venture capitalists and other would-be donors. Churchwell said she connected with people who donated to her organization after she delivered her pitches. Keuth said the event doesn’t just benefit the competitors, but it helps the Phoenix community.